It was our pleasure to be invited to LG Optimus G Singapore Launch Event. 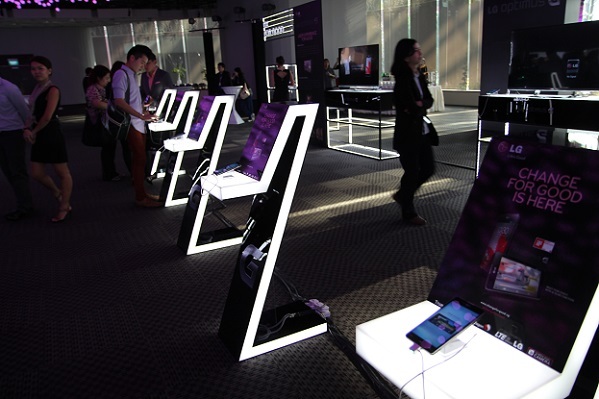 LG Singapore spared no effort for the launch, and the LG Optimus G, the premium flagship smartphone that has been making waves in Korea, Japan, United States and Canada, was launched in Singapore today at Jubilee Hall, Gardens by the Bay. LG’s campaign revolved around Change. It’s a positive message, to embrace change and change for good, and more importantly, to seize the day. The campaign strives to encourage and empower Singaporeans to make positive changes in their lives. 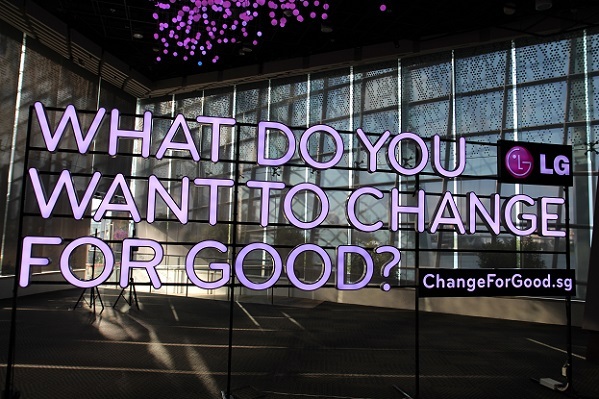 Over the past week, the message of change has been popping up in various locations across Singapore, inviting people to think about what they would want to change for good. This is envisaged in the phone, with the Optimus G representing a marked change in LG’s approach to the design and engineering of its mobile offerings – a change for the better, bringing the best-of-breed technologies together in a spectacular new design. The LG Optimus G packs a powerful quad-core CPU, Snapdragon™ S4 Pro processor, together with LTE capabilities and 2GB of RAM, makes its Android Jelly Bean operating system zippy and responsive. We knew the Optimus G was fast and in the demonstration carried out by LG of the phone versus similar competitors, looks like the S3 and HTC One X, the Optimus 4G truly shined. Detailed specs can be found here. The IPS HD display was also proudly featured and I have to admit, my Samsung AMOLED screen fared badly in terms of colour saturation against the LG Optimus G. The colour accuracy and over natural, non-saturated colours proved more suited for video viewing. The Optimus G Zerogap Touch Technology was supposed to make the user touch experience more immersive but it wasn’t that apparent to me. Battery life has been one of the biggest complaints of smartphone users today and LG has hoped to address this issue with a 2,100 mAH and less power intensive hardware specs such as an eco-mode for the quad-core processor and the lower power consumption of the IPS screen. Overall, the 2,100 mAH battery should help ensure the phone sustain a day use, and according to LG’s test, the talk time and standby time are 15 hours and 335 hours respectively. In design, the Optimus G is awarded the iF Product Design Award 2013. While my friend felt that it was a tad too squarish looking, I thought that gave the phone an edgier look. Furthermore the back of the phone has a crystal, reflective surface that isn’t apparent at first glance but with the right lighting angles, will sparkle beautifully. 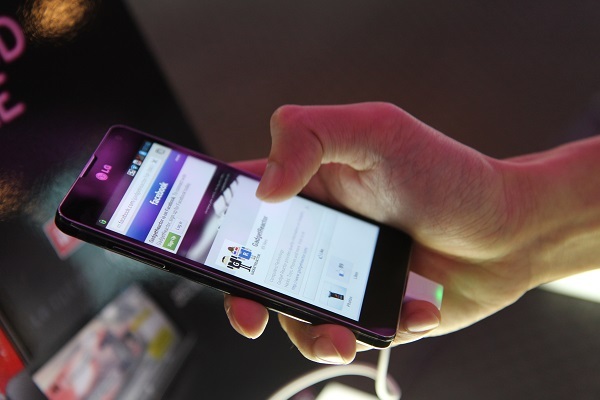 For the Optimus G’s unique look, LG developed and patented Crystal Reflection finish, which is applied to the back of the Optimus G for a luxurious look and feel. Crystal Reflection displays different patterns when viewed under different angles and lighting, while its intricate polarised pattern provides the phone with a touch of sophistication, reminiscent of a finely-cut jewel. Sadly most people will cover the back with a casing. To preserve this beauty, you may wish to invest in a transparent back protector sticker type. Beyond the hardware specifications there are a number of software aspects of the phone that makes it stands out. The Singapore Optimus G has now been upgraded to Jelly Bean OS 4.1.2 and comes with an impressive software suite. LG have focused quite a bit on improving the overall user experience to enhance productivity and at the same time, making it fun. Personally, I like the ability to peek behind the lockscreen for a quick view and also the QuickMemo function which allows me to quickly scribble on any display on the screen. You could easily add annotations and drawings to any picture or screen caps. For e.g. you are surfing a website and want to draw the attention of your friend to a particular image, you could easily circle it and send it to your friend. Dual Screen Dual Play – Seamlessly share selected content with a larger display while performing other tasks on device. Dual Screen Dual Play enables mirroring of displays between the smart phone and a TV, and also has the ability to display different content on each screen wirelessly. We didn’t have a chance to really play with this but the demo looked impressive. Not sure if this is limited to LG TVs or also accessible with Miracast (which is an available feature) as well. LG suggested the following scenario to describe the dual screen dual play feature. There were other smart innovative features of the Optimus G User Interface that we thought were pretty innovative and unique to LG. We will provide a more detailed update on the software aspects of the new LG user interface at a later stage. We were also introduced to another LG toy, the LG Pocket Photo printer which allows printing of name card size photos through Bluetooth, NFC and USB. We tried out the NFC printing. It worked very well. I tapped my Samsung S3 to the printer and it launch Google Play Store asking me to install the LG Pocket Printer application. It is expected to cost $249, and availability can be enquire from the LG Concept Store in Singapore. After installing, the next tap ask me what photo I want to print and offered me to browse for it or to take a photo with the camera application. If I had pre-selected a photo the app would then straight away send the photo over for printing. It worked seamlessly and in a very intuitive manner. I was impressed. We understand that the printer use thermal ink or Zero-Ink technology and thus all you need to buy is the cards or photo paper. In addition, it’s incredibly small — the size of the printer is about a small portable HDD. The phone would be available for sale from Singtel, Starhub and M1 this Saturday. Pre-orders from Starhub and M1 commence today. Starhub has a fantastic promotion package at the moment, customers get a free phone case, screen protector and portable mobile charger (worth $166) and on top for the first 100 customers, also get a LG Pocket Photo Printer (worth $249). M1 users can get a FREE accessory gift pack (worth $100) when you purchase the LG Optimus G on a 2-year contract. The accessory gift pack comes with two flip covers and a screen protector. Indeed, LG has done well with the Optimus G, the sibling of Google’s flagship device, the Nexus 4. We’ll never know when the Nexus 4 might be launched in Singapore but till then, the LG Optimus G is a worthwhile consideration for a top end Android phone. We had always knew the Optimus G was a great phone but having the opportunity to see it in person and to try out the various features help to reinforce that aspect and it would be interesting to see what pricing the three Telcos would announce the Optimus G for. Official RRP for the Optimus G is S$798 but a quick check on indicative pricing at prices without contact for mobile shops seems to start from $670! That’s a great price and should tempt a few people to the LG camp. I will definitely get this over the Samsung Galaxy S3 LTE which has poorer specs but $60 more expensive.